It's that time of the fourth year again: 2010 FIFA World Cup Soccer is here! And what a better way to watch the games than in a fabulous outdoor garden! Adidas and the Soho Grand have collaborated to hold the World Cup gatherings every afternoon from June 12- 20th, with some barbecuing and some open bar involved--it just can 't get any better than can it? See details below. FYI: Show up early as to avoid waiting on an unpleasant line and risk being denied entry. 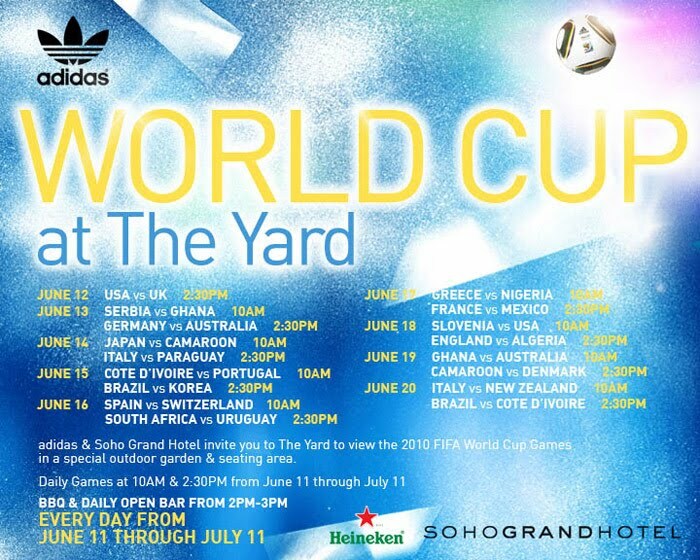 Soho Grand Hotel & Adidas invite you to The Yard to view the 2010 FIFA World Cup games in a special outdoor garden & seating area.